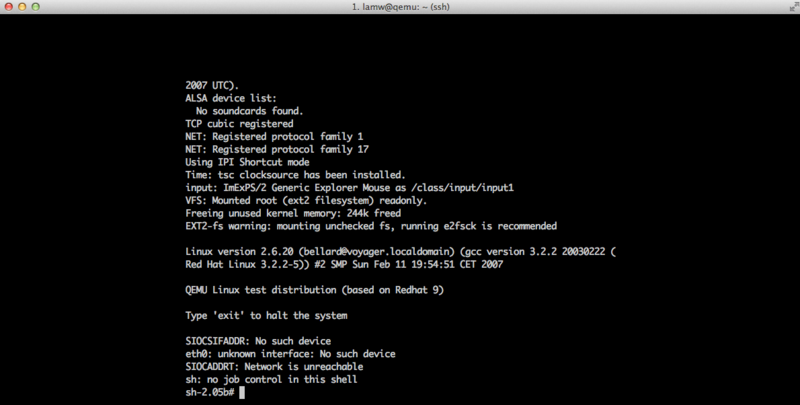 You are here: Home / ESXi / How to run Qemu & KVM on ESXi? 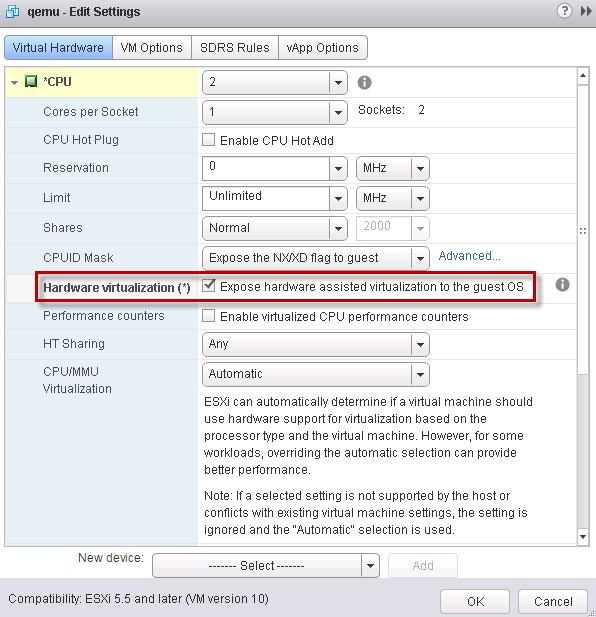 Last week I was asked whether ESXi could run the KVM hypervisor as a Virtual Machine (often referred to as Nested Virtualization). I personally have not used KVM before or run it on top of ESXi, but I have heard of many folks successfully virtualizing KVM as a Virtual Machine on top of ESXi. I figure since I have already written several articles on Nesting VMware ESXi, Microsoft Hyper-V and Xen on top of ESXi, I might as well also take a look at KVM! Disclaimer: Nested Virtualization is not supported by VMware, please use at your own risk. As mentioned already, I have not used KVM before and one thing I wanted to understand before trying to run it as a Virtual Machine is what the difference is between Qemu and KVM as I have heard both these terms used in-conjunction before. I found this post to be quite helpful in helping me understand the differences between Qemu, KQemu and KVM. I recommend a read if you are new to Qemu or KVM like I am. From the article above, we now see that you can run either Qemu as a standalone system or KVM which is an accelerator that runs on top of Qemu. With this, I will now demonstrate how you can run Qemu as well as KVM as Virtual Machine on top of ESXi. 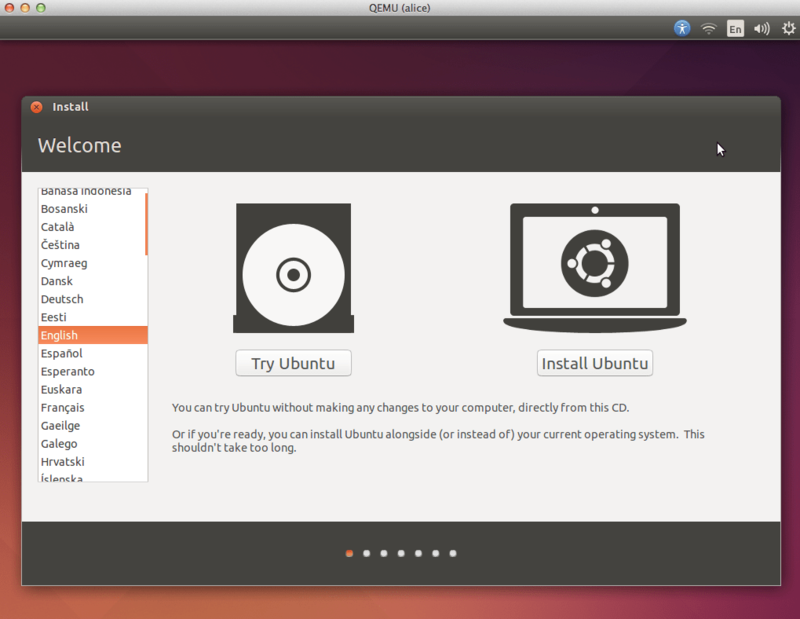 In the example below, I have selected the latest Ubuntu release (14.04.1) to run both Qemu and KVM. Note: You can also find other Qemu images here. Step 7 - You will need to make some changes to the XML file such as the location of the Ubuntu ISO (which is required to boot the VM) as well as the lP Address of the VNC service for console access to VM and lastly the UUID identifier of the VM which can be generated by running 'uuid' command. Very helpful post! I was looking to get KVM support on my GNS3 VM after moving it to ESXi from VMware Workstation. Your configuration from the vsphere web client was spot on! This blog was very informative one. I came across once thought of running ESXI over any other hypervisor. 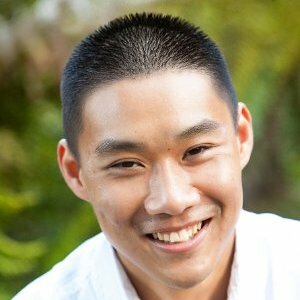 Is it currently support in vmware ? Do you think it would theoretically be possible to use Qemu to run a Mac OS 9 virtual machine on an Xserve running ESXi6?